The Fast Lane RC Street Pro Racer cars are manufactured by PlayMind Ltd. for Toys R Us. 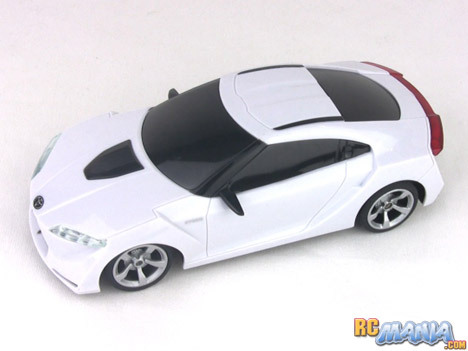 You can get a silver Nissan GT-R (R35 model), a late model Ford Mustang, or this slick Toyota FT-HS (next-gen Supra) prototype that I received for this review. At about 8" long, they're considered 1/24th scale. Outwardly they look great even just on display, with pretty accurate proportions. What really surprises me for the small size and low cost is that these cars have suspension -- independent in the front, and a pivoting solid axle in the rear. They also have working lights that come on whenever the car is moving! Cool features for the price, but of course what really counts is going to be how well it drives. When the rubber hits the road, the RC Street Pro car rolls out with the quickness. In driving tests, it again exceeded my expectations with very good speed for its size, a smooth, quiet ride thanks to the suspension and the weight of the detailed body. It also steers very sharply and quickly. It doesn't have digital proportional controls, so when you command it to turn it gives you immediate full steering. The rubber tires have plenty of traction, and the car happily goes wherever you tell it to with no hesitation and no delay. This is a $12.99 toy RC car made for kds just 5 years old and up. For what it is, it is great. You definitely get your money's worth and more. I simply have not seen anything better for the price. I only wish they made additional body styles in this series so we would have more choices. Also, all three in the series are on the same radio frequency, so siblings can't run different cars at the same time. As a super-inexpensive car for a small child, though, you can't go wrong with this one. Use rechargable AA batteries and it'll be endless fun.